Following US officials stating that the laptop cabin ban is being extended to Europe and Britain, First Luggage has been inundated with bookings from business travellers, families, and international students. We offer a door-to-door delivery service, with collection from one address and delivery to the destination address. With a license to ship ‘dangerous goods’, First Luggage are therefore able to ship electronic devices, such as laptops and tablets, which will soon be banned on flights between America and Europe. Clients booking their laptops with First Luggage have realised that also sending the rest of their luggage door-to-door will allow them to travel hands-free, cutting out the stress of travel and eliminating the risk of the airlines losing their bags. Author First LuggagePosted on 12th May 2017 12th May 2017 Categories UncategorisedLeave a comment on What laptop ban? When Rachel and I started planning our trip to Thailand and to Hong Kong over Christmas and the New Year, we immediately realised that we would have an issue with our luggage. Because of late booking-related flight availability, we were flying Economy on Virgin Atlantic from London to Hong Kong, then transferring directly to Air Asia flights to Phuket. We would then spend nearly three weeks travelling on land and sea between various Thai islands in the Andaman Sea, before flying back to Hong Kong to spend three nights in the city. As we soon realised, Hong Kong was going to be fifteen degrees cooler, and rain was forecast. Rachel and I would both be taking work meetings in smart places. That meant an entirely different wardrobe of heavy things: coats, jeans, heels, shirts, and sweaters. But we certainly didn’t want to lug all this stuff around the islands for three weeks, getting progressively more musty and crumpled, and taking up valuable bikini space in our cases. And, not only did we not want to lug around huge amounts of clothing, but we were bound by the 23kg Economy allowance, and we needed lots of lovely summer stuff for three weeks on the islands. Whilst I no longer carry around twenty books on my trips, thanks to the glorious Kindle, it’s amazing how much your bags can weigh. Spending the first ten days in smart resorts, (check out Sri Panwa on Phuket here), meant we didn’t just want to pack bikinis and sarongs, but Christmas and New Year party frocks, and pretty sundresses. Then there’s the weighty bottles of skin and suncare for three weeks: of course you can buy that stuff out there, but when you already have it, and you have specific skin needs, you don’t particularly want to resort to a bottle from the local stop and shop. And don’t even get me started on my heavy tech requirements, from cables to AirPort, speakers to laptop. So I looked into paying for an extra case for both of us on Virgin, and leaving it filled with our Hong Kong clothes at left luggage in Hong Kong’s Chep Lap Kok airport. Hmm: at $140/£12 a day, we would be looking at somewhere around £220 by the time we picked it up, plus £50 for the extra case. And £50 to take it back again. Plus the pain of getting two giant cases to and from the airport in London, and having to seek out Left Luggage on both arrivals in Hong Kong. Then I remembered First Luggage, who had been in touch with me earlier in the year. They kindly agreed to let us trial the service for the trip. It worked like clockwork: I left the extra case in London and it was picked up from my office three days before we were due to arrive at The Island Shangi-La Hotel on Hong Kong Island. It arrived the next day at the hotel – we had forewarned them, and they kept it in storage, delivering it to our room in advance of our check-in. This is the case – neatly protected with plastic and packing tape, waiting to be unpacked in our beautiful room. 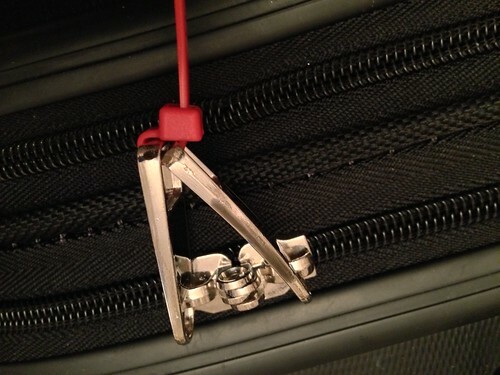 First Luggage attached cable ties to all the zips, for extra security. 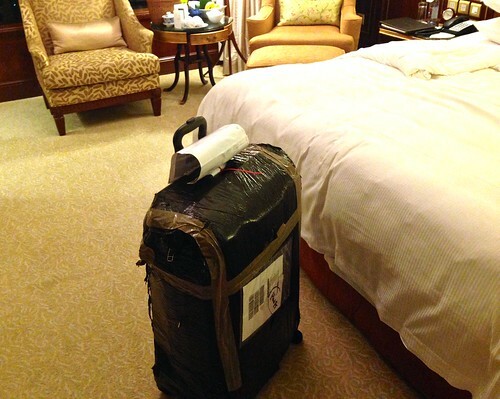 The day we left Hong Kong, we re-packed, affixed the necessary airway bill and left the case with the concierge at The Langham Hotel (we stayed there for our final night). It was picked up after we left and arrived back at my London office twenty-four hours later. I cannot recommend the service highly enough. Even if we weren’t trialling the service, we would have booked it anyway for all the reasons listed above. It saves time, money and faff, and works seamlessly. I was talking to blogger BryanBoy on Twitter about First Luggage when we were in Hong Kong. He loves it for fashion week season, meaning he can send on his extensive wardrobe of looks ahead to the different cities on the circuit. It also makes sense for bulky sports equipment for trips, like skis and golf bags. And, if you are a business traveller, you need never use a check-in desk again, arriving at the airport at the last possible moment because your luggage will have been picked up in advance from your home or office. How it works: The service is door to door, picking up from your chosen address (home, place of work or hotel). You book your luggage delivery online or call a First Luggage customer advisor, who will then send by post or email your outbound and inbound luggage travel documents (airwaybills), which you affix to each piece of luggage ready for collection. The First Luggage team then monitor your shipment every step of the way with their state of the art tracking system, and delivering to the address of your choice, and guaranteeing to deliver on time – or give you your money back. First Luggage also run a same day delivery service London – Paris, Paris – London. Whether it is a family holiday, a romantic trip for two or travelling to find yourself, beaches serve as universal gathering points for all walks of life. We have compiled a list of 7 of the most unusual beaches across the globe to transform the conventional beach experience into an unforgettable one. A sanctuary for endangered Green Sea Turtles, the stunning tropical black shore of Punaluu seems almost otherworldly. Day trip to Mars, anyone? You’ve landed. Finally. You groggily follow the signs for Baggage Reclaim and eventually after what seems like a lifetime of revolving doors, you reach your carousel. Fantastic! – You’re one of the first there. You’ll be out of here in no time. You were at the front of the queue at check-in and you’re sure that means your luggage will be among the first to be released – that’s how it works, right? But with each unfamiliar bag that makes its way round the conveyer, you grow more and more anxious. People begin to leave, suitcases stacked high on their trolleys; meanwhile you are sheepishly replacing yet another bag that you have mistaken for your own. Just two bags left on the conveyer now. They pass you three, four, five more times. Still no sign of yours. You walk over to the dispenser tunnel and peer in optimistically, praying for a glimpse of that red-and-white-polka-dot ribbon you had smugly tied to the handle. Still no sign of yours. Baggage handling, or rather mis-handling, continues to be one of the single largest hindrances to an efficient airline passenger process. In SITA’s Baggage Report of 2016, a colossal 23.1 million bags were reported to have been lost, delayed or damaged. Andrew Price, head of Airport Operations Management of the International Air Transport Association admits that airports are crippled by capacity issues in their baggage halls. Given that the baggage handling systems are already operating above design peak, this is clearly an issue which is only going to get worse with passenger numbers estimated to be around 7 billion by 2034. One commonly cited tip is to ensure bags are checked-in well in advance, and all major airports echo that passengers should arrive 2-3 hours before a flight’s departure. However, Don Harris, senior director of ground operations for Southwest Airlines advises that “if bags are coming in for a flight that departs in three hours… it could become a case of out of sight, out of mind”. This also speaks volumes for the lack of care and respect that mars the baggage handling system – Lucian Ilie, a former baggage supervisor at JFK admits “the lost bags don’t really get much attention…they just get kicked around”. In the outrageous footage below, baggage handlers were caught hurling suitcases from an easyJet plane “like rubbish bags onto a waiting truck”. Once bags are handed over at the check-in desk, most passengers fail to appreciate the myriad of stages that occur before the bag reaches them at the other side (or fails to, as the case may be.. ‘scuse the pun). Since “a modern baggage operation is a mashup of high-tech innovation and old-fashioned grunt work”, a single mistake from an employee working in remarkably trying conditions can all but ruin your eagerly awaited and meticulously planned trip. We can’t cram everything into our hand-luggage, and even if we could, passengers flying with airlines such as RyanAir and Easyjet have a less than 50% chance of their hand-luggage flying in the same plane as them. The solution? Door-to-door delivery. Cut out the airlines completely. Apart from making the entire process of travelling a lot easier, you will not have to take a gamble on your personal possessions every time you fly. So Amy, you specialise in the luxury market. What are the main differences working in ‘luxury’ to other areas of event planning? Well, event planning is all about detail and whether an event is ‘luxury’ or not doesn’t mean you plan it any differently. You may be working with higher end suppliers and with clients that have extremely high expectations but as an Event Planner my expectations are always high by default. I always expect the suppliers I work with to deliver to the absolute best of their ability regardless of whether they are in the luxury market or not. An interesting point, but still a pretty great niche to work in. What’s been the best event you’ve worked on? Ah, this is so hard to answer! I’ve worked on so many lovely, amazing events all around the world, from luxury incentive trips to Zambia and Botswana, chartering private planes and taking over exclusive safari lodges to a global meeting at the UN Building in New York. I think for me it’s all about opening guests eyes to a whole new experience, whether it’s the best dinner they’ve ever had, driving a luxury car, or experiencing a destination as a whole. That’s the buzz for me. You must have visited some amazing places, what’s the most luxurious? Grand Hotel a Villa Feltrinelli on Lake Garda, Italy stands out. I was there in September as Consultant Event Manager running a driving tour through Italy for Elegant Resorts and Aston Martin. Not only was the hotel stunning in interiors and location, but the attention to detail and service levels absolutely blew me away. It was probably the most luxurious hotel I’ve ever stayed at and was a privilege to work with them. They made my life very easy! Sounds stunning, I’ll be Googling straight after this. Now what about insider tips? Any planning hints you can give to those who might want to arrange something special for their clients? I’ll give you six, any more and I’d have to charge you! 1) Put everything in writing and keep a copy with you at all times, whether it’s on an email on your phone or in a folder. You never know when you’ll need it. The one time you don’t have it in writing, you’ll need it, it’s guaranteed. 4) Trust your instincts, if you think a venue / location /supplier isn’t right, it probably isn’t! 5) Always consider the experience from the end client / guest perspective – walk it the whole experience minute by minute as if you were them. 6) Never leave home without – a fully charged phone with all the numbers you might need pre-loaded, a bold lipstick and a smile. What do you look for when you are sourcing a venue, particular with your luxury clientele in mind? Service, service, service. This is the easiest thing for a venue to get right (and it’s free!) but so many get it wrong. I would only ever recommend a venue that I know will deliver. That’s also why I rate First Luggage, they are one step ahead always anticipating their client’s needs rather than waiting for problems to occur. Also a client’s experience starts from the moment they leave their front door, what better way to start a trip than to have your luggage taken from your door and to be at the venue when you arrive? If you could plan an event anywhere where would it be? I love Scotland, it’s just beautiful all year round. I recently worked at an exclusive use fairytale castle on the shores of Loch Ness – Aldourie Castle – 13 bedrooms, amazing service and a real house party feel – but in your own castle. Luxurious but in no way pretentious. It really was the stuff dreams were made of. If you could work with any brand what would it be? Ooooo tricky question. One with lovely clients! Thanks Amy, we look forward to hearing about your next event. To find out more about why top luxury planners use First Luggage check out our testimonials page here. Whether it is a once a year trip to Cannes, or an ambitious attendance at all the world’s high-profile film festivals, there is no doubt that packing for the event will require a great deal of care and attention. A red-carpet premiere requires an eye-catching and awesome outfit that will capture the attention of the press. During the day, screenings, interviews, meetings and networking demand impeccable style and possibly a few changes. These are not occasions to be travelling lightly. It is better to err on the side of caution and take more clothes than is strictly necessary, so as to be able to adapt to the climate and any spontaneous opportunities which may crop up on the circuit. Different festivals call for different approaches. Sundance in Utah in January is famously cold. It will be imperative to take a warm outer coat that can easily be slipped off as you go in and out of the various venues. Many festival-goers like to combine their trip with a spot of skiing. As ski equipment and attire tends to be bulky and cumbersome, you really don’t want to be lugging that with you en route to the hotel. Far better to arrange to get it sent on ahead with a luxury travel delivery service. Gowns, jewellery, tuxedoes and high heels are de rigueur for these glamorous international events but you will also need an array of smart casuals, and in cities like New York, Venice, Berlin or Toronto, there is an elite of the well-dressed and urban chic. The film business is all about appearances and if you are representing a movie in any capacity, you need to present yourself as an ambassador for the brand. Whether you are a film star or not, you can travel like one with a large stack of luggage, and be prepared for the paparazzi on any corner. Getting these bags pre-delivered also allows for assistants or hotel staff to hang garments, or press them, meaning you can hit the ground running on your arrival. One item you will want to keep on your person is a watch. With a hectic schedule and many different timings to adhere to, it is much easier to glance at your wrist in a darkened cinema than to check your phone. Tucked away in the south of Switzerland you will find Zermatt, surrounded by astonishing mountain vistas – such as the Matterhorn – and plenty of high altitude skiing. There is no shortage of choice in luxury accommodation in and around Zermatt. Notably, the Mont Cervin Palace, situated in the centre of the village, has an international reputation for excellence and is within short walking distance to local shops and some of the finest skiing Europe has to offer. For a fresh gourmet dining experience, you may wish to consider dining at The Omnia, which as well as gourmet serves a la carte and fine vegetarian cuisine. Ski luxury travel luggage delivery with a company like First Luggage is a great idea, as the area can only be accessed by train. Within Les Trois Vallées, situated in south-east of France and north of Marseille, Courchevel 1850 is, for many people, the last word in luxury skiing. It can boast of being part of the largest interconnected ski area in the world, as well as being home to no less than four Michelin restaurants with two stars and three with one star. You can soak up the genuine alpine dining experience at La Table Du Kilimandjaro while sampling the notoriously exquisite wine collection. In keeping with the luxury of its surroundings, Le Lana is one of the many notable five star hotels that attract visitors back time again. As well as being the most fashionable ski resort in Italy, Cortina has breath-taking views of the Dolomite mountains and plenty more to offer than simply adrenaline on the pistes. LP 26 Prosciutteria is one of the resort’s busiest restaurants due to the popularity of its many different types of prosciutto (cured ham) which is said by many to be unparalleled. Luxury accommodation is similarly well catered for, with the Cristallo Hotel Spa & Golf a great base from which to enjoy everything the area has to offer. If you’d like help choosing your next luxury ski break or our assistance on how to get your things there then please get in touch! There is no doubt that London and Paris are two of the world’s greatest cities, and thanks to the wonderful invention of the Eurostar, travelling between them has never been quicker or easier. When you are over in Europe on a trip from the States, it is a fantastic time-saver to be able to hop on the train at London’s St Pancras and be walking out at the Gare du Nord in Paris in three hours. The only thing that can slow down the process is having to look after your own heavy baggage. Unlike the Golden Age of Travel when every American in Paris could rely on a fleet of porters to cope with their trunks and valises, these days, the burden of luggage is often a huge hassle. Not only is it awkward to get on and off the train, it has to be stowed, and then dealt with all over again on arrival. Having to cope can cause anxiety and lessen the pleasures of the journey. Eurostar have recognised this inconvenience, especially for their American customers who may be over for a few weeks’ vacation in Europe and carrying quite a lot of bags. They have teamed up with Euro Luggage Delivery to completely solve this problem. Stress-free door-to-door luggage collection means you can travel completely hands-free, and your bags will be waiting for you. The same-day service between London and Paris, and vice versa, is completely safe and reliable and luggage can be tracked at all times. It doesn’t matter if you are staying in the Ritz or in an Airbnb, whatever the destination, you are free to make your own way and find your luggage ready to unpack. London, Paris, and many of the other famed European capitals offer superb opportunities for shopping. No-one wants to resist the lure of exceptional merchandise, whether for investment or simply for souvenirs. Worrying about what will fit into your suitcases to take back is no longer an issue when you book with luggage collection and delivery. Most items can be sent, and door-to-door means exactly that; whether it’s a hotel, a home or a place of work address you submit. Make your next trip to Europe even more enjoyable and send your bags on ahead. Get in touch with us today in order to help you plan your trip! The adrenaline rush of gliding through picturesque mountain valleys is something everyone should experience at some point in their lives. First Luggage is a luxury travel luggage delivery service to ensure that you have one less thing to worry about when jetting off to your ski destination. Jackson Hole has been ranked one of the best skiing destinations in the United States. During winter, snowfall is usually guaranteed, so booking in advance won’t be a problem. Corbet’s Couloir is the resort’s most famous ski route, consisting of a steep, narrow chute. The destination is great for beginners and intermediates due to the variations in terrain. If you are feeling peckish, there are plenty of restaurants and food outlets to grab a bite. Couloir Restaurant and Bar is the most exclusive eatery on the complex, with stunning views to match. If you have a sweet tooth, Corbin’s Cabin sells delicious waffles. Lake Tahoe is a must-visit for families with plenty to do around the area, so boredom will never be an option. Resorts in Lake Tahoe to visit include Heavenly, Squaw Valley and Northstar. The resort consists of granite mountains and crystal clear waters, as well as fantastic shopping districts and nightlife, hot air ballooning and scenic cruises. Essentially for beginners, this destination is great for those getting their first taste of skiing. There are a number of nursery slopes and chair-lifts to ensure that you are not too out of your depth. If there intermediate skiers in your party, there are also facilities for them. The Victorian-style town has a number of shops, bars and restaurants to explore in the evenings. On the resort itself, there are a number of fine dining options including ‘Seven’; an old-world inspired cuisine with an outdoor area to sit and take in the views. There are also on-site spas to relax in at the resort. If you would like any further information about ski destinations and luggage services, please contact us! Our online booking system is now available for you to book all your door-to-door luggage delivery needs. Want to get in touch about our door-to-door delivery services or make a booking over the phone? We would be happy to help. Get in touch with us anytimexx.